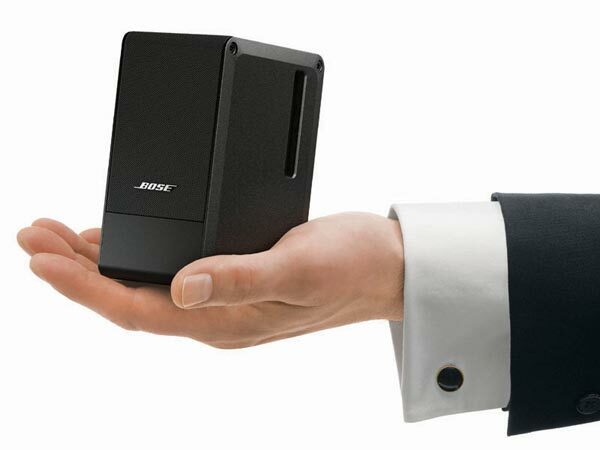 Pricey miniature desktop speakers from Bose prove to be a worthwhile choice for buyers with deep pockets and a yearning for clean sound and uncluttered desktops. Bose products tend to cop a lot of flack from audiophiles and home theatre buffs. The cognoscenti are quick to dismiss Bose as a marketing company and its products as lightweight kit designed for those who prefer to sample the illusion of good sound rather than biting into the real thing. Regardless of one’s thoughts on the company or its huge range of equipment, it behooves any audio reviewer to keep an open mind. 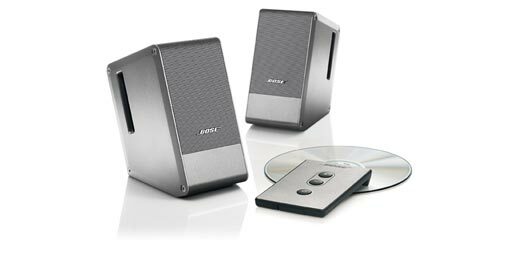 In fact, while some Bose products have proved underwhelming, I’ve been pleasantly impressed by a number of its goodies over the years and the tiny Computer MusicMonitor multimedia speakers in particular made a strong impression. Computer speakers are one of the few areas of consumer technology where it’s possible to buy a genuinely bad product. Cheap home theatre in a box systems are another example but PC speakers can be dire in the extreme, especially the woeful plastic things that come bundled with computer packages. They generally cost very little and are worth far less in terms of build quality and performance. Then there are the bigger 2.1 or 5.1 systems complete with “subwoofer” (ie, a feeble four to six inch paper woofer in a chipboard or plastic box that goes ‘boompa- boompa rattle’ when it should go ‘bang’). Fortunately, there are some very good PC speakers out there from manufacturers such as Klipsch, Logitech, Harman Kardon, and JBL. You can feel free to add Bose to that list, if the Computer MusicMonitors are anything to go by. It’s hard to comprehend the idea that two metal boxes small enough to fit on the palm of your hand can cost six hundred bucks, but then again, it’s also hard to understand how the same little boxes can produce such a big sound. They’re really well put together and the build quality and finish is up there with the best, which goes some way to allaying concerns about the price; the sound quality does the rest. The mini Boses are constructed from aluminium and use internal Class D amplifiers to power Neodymium magnet-equipped drivers. There’s a power switch and volume controls on the side of the right hand speaker and a remote control with the same functions is supplied. Power comes from a brick type power supply, which has cables that are long enough to allow it to be well hidden, leaving just the power and audio cables to deal with on the desktop. The angled design points the speakers up towards ear level, which opens the soundstage, and this is further improved by getting some space between the speakers and angling them in slightly. The midrange is clean but the top end is ever so slightly bright – not hard or annoying though, and this can be eased somewhat if three small blobs of Blu-tak are used beneath each speaker to isolate them. Driven by a computer sound card or MP3 player, they’re enjoyable to listen to, sounding big, detailed and energetic, going quite loud and staying tighter in the bass with a wider soundstage than many iPod docks. They’ll do double duty as part of a small stereo system, but are at their best in a nearfield environment i.e. on a desk alongside a monitor, where they sound particularly good, making an office environment a lot more tolerable over a long day (your colleagues might not agree if you’ve got a thing for music they dislike). They’re quite good with games as well, proving dynamic enough to stay up with the play, but if you insist on the room shaking when you frag a bad guy, look elsewhere. Let’s not beat around the bush here. It’s possible to get high quality desktop sound for far less money. It’s also possible to surpass these little silver boxes sonically but that involves bigger speakers and almost inevitably requires a subwoofer. Or you could go the whole hog with a USB DAC running a desktop amp or powered speakers.